As such, the way Froyd sits is how he sits in the original painting. Non of CTA3's new motion files or character rigs for quadrupeds are front facing and therefore not suited to him specifically. However that's where CTA3's free bone characters fill in the gap. Anything that doesn't fit to a human, quadruped or spine template can still be animated with free bones. 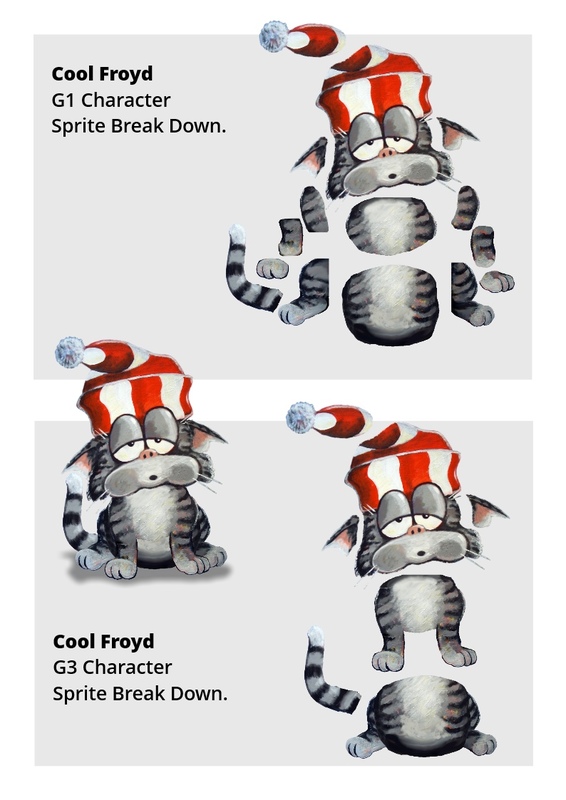 To help understand the difference between G1 and G3 characters take a look at the sprite breakdowns on the right. G1 characters are essentially puppets with each body part pinned together at the joints with a very simple bone system. G1 Froyd uses 15 sprites if you include all the head sprites. In contrast, G3 Froyd uses only 7 sprites whilst still retaining the same range of movement using image warping. G1 characters do have some ability to distort and warp body parts to create a wider range of movement but not to the degree of G3's system. If you compare bone systems (in yellow in the images below), G1 Froyd uses a severely distorted, front facing human template. He has an upper and lower torso with complete front arms (upper arm, lower arm, paw). His back leg sprites only move when the upper leg bone is moved. Although it is possible to segment a G1 character's tail, Froyd's tail is all one sprite and therefore not flexible. Even if I did segment it, G1 character tails contain no bones, they're simply pinned to the character and have to be keyframed manually. If you look at Froyd's G3 character rig (below) you can see he has many more bones that closely match his original, seated position. He has multiple bones in his tail allowing it to bend and move more naturally than the G1 version. 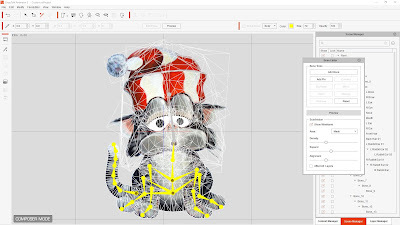 Additionally, G3 character bones are supported by sprite meshes that determine how the image will be warped and distorted when a bone is moved. The finer the mesh setting the smoother the warps usually look. G3 Froyd's body meshes are all at their most detailed settings. Froyd's G3 Bone Rig with Meshes turned on. 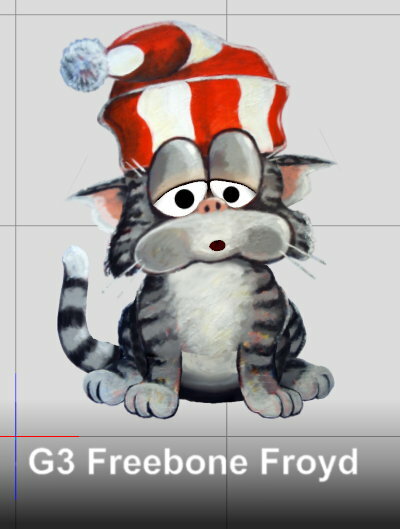 G1 Froyd uses CTA's morph based head, which gives the characters face a semi three dimensional appearance. It's the fastest way to give a front facing character a really expressive, easy to animate face, in the least amount of time. CTA3 retained this feature. As I was very happy with how it worked I didn't see any need to change it for my updated Cool Froyd rig. Though I would be interested to try a version of Froyd with the new G3 Facial Morphing head which uses sprite swapping teamed with image distortion to create a greater range of facial expressions. You can see both G1 and G3 Froyds animated in the short comparison video below. While both can handle the same range of positions and movement the G3 version looks just a little more natural with the body bending at the joints, rather than pivoting, more like you'd see on a real cat. 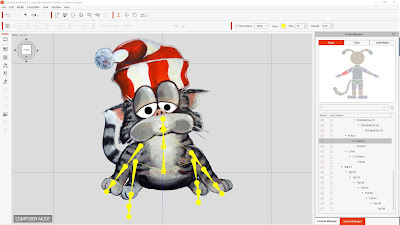 The only downside to a G3 Free bone character is that none of the motion file templates will work with them (other than the spine motion templates to a limited degree). This means every movement has to be key framed manually. Fortunately you can export character motions that you'll think you'll use with the character again, and even save them out to an action menu that you can add to the character at any time. This gives you the ability to right click on the character, which brings up the action menu where you select from all your saved actions. Over time you'll build up a motion library for the character resulting in less manual key framing on future projects. Overall this makeover of Cool Froyd has been worthwhile. The G3 Bones and mesh system drastically simplify animating him though you do have to be a little careful not to cause too much distortion with the mesh warping. I liked that CTA3 still supports the original Morph based heads of the first generation of the software as these are still quicker to set up than any other head type and work well if you don't need a complete side view of the character's head. I'm looking forward to animating this new version of Froyd in future episodes of his series. Thanks for sharing a technical informative article. I never thought making a cat in this software can be so easy.